EDMONTON, AB – August 28, 2015 – Home2 Suites by Hilton® West Edmonton has been named an Expedia Insiders’ Select hotel for 2015. This annual list represents a ranking of the world’s best reviewed hotels as determined by direct customer feedback on the online site, Expedia. Home2 Suites by Hilton® is an award-winning mid-tier, all-suite hotel brand designed for modern business travelers and extended stay guests. Hotels recognized in the 2015 Insiders’ Select hotel are ranked based on more than two million customer verified reviews, meaning Expedia confirms the traveler’s booking on Expedia in order to review the property. Winning hotels are identified as properties in top global destinations providing excellent overall guest service and maintaining a minimum guest review score of 4.7 out of 5. Owned and managed by SilverBirch Hotels & Resorts, Home2 Suites by Hilton® West Edmonton is the brand’s first Canadian property. The hotel offers easy access to technology and inviting community spaces, as well as the trademark Home2 Suites amenities, such as the Oasis lobby, the Home2 MKT for grab-and-go items, the Spin2 Cycle, a combined laundry and fitness area, and complimentary continental breakfast at the Inspired Table that includes a variety of morning favorites such as cereals, hot artisan breakfast sandwiches, waffles, yogurt and more. All Home2 Suites properties are also pet-friendly. SilverBirch Hotels & Resorts is also the recipient of the 2015 Hilton Worldwide Development Deal of the Year Award for the successful development and introduction of the Home2 Suites by Hilton® West Edmonton to the Canadian market. The use of pre-fabricated structural steel studs for the building’s framework instead of the traditional wood frame structure expedited the construction period and ensured minimal impact on the community during construction. 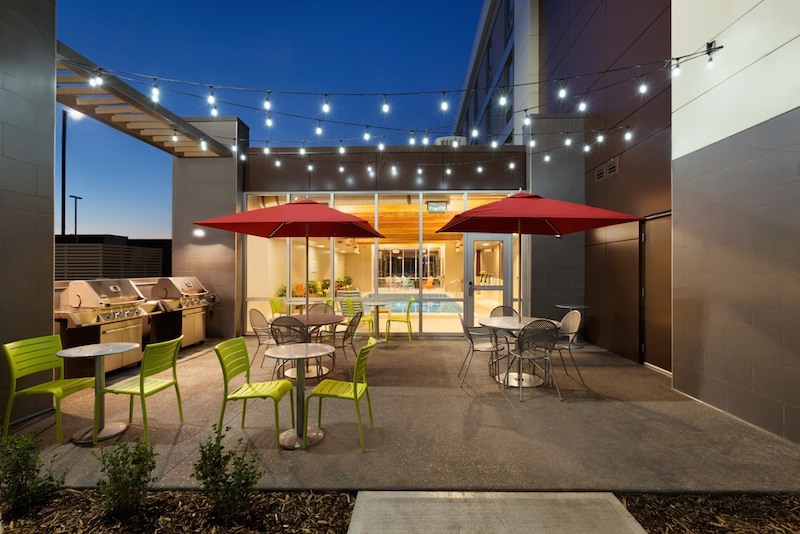 Home2 Suites by Hilton® West Edmonton celebrated its one year anniversary on July 30th, 2015. For more information or to make reservations, please visit Home2 Suites by Hilton® West Edmonton or call +1 780 509 1230. Read more about Home2 Suites by Hilton® at www.home2suites.com and www.news.home2suites.com . Home2 Suites by Hilton®, one of the fastest growing brands in the history of Hilton Worldwide, is a mid-tier, all-suite award-winning extended-stay hotel concept designed to offer stylish accommodations with flexible guest room configurations and inspired amenities for the cost-conscious guest. With a commitment to environmentally friendly products and hotel operations, Home2 Suites offers complimentary breakfast selections with hundreds of combinations; innovative and customizable guest room design; laundry and fitness area; complimentary Wi-Fi Internet access; multiple outdoor spaces; 24-hour business center; expansive community spaces; and a pet friendly environment. With Hilton’s award-winning digital check-in with room selection tool, Hilton HHonors members can log into their accounts and choose their exact room from a digital floor plan, as well as customize their room prior to arrival with amenity requests. The service is available for 650,000+ rooms at more than 4,100 properties across 11 brands worldwide. Visit www.home2suites.com for additional information or www.home2franchise.com for franchising opportunities.